Simon Makin is a science writer in London. In early 2018, two high-profile clinical trials of drugs for Alzheimer’s disease ended in disappointment. The drugs joined a long list of potential treatments that have failed to deliver significant benefits in people. Their development was guided by an idea that has dominated research on Alzheimer’s disease for more than 25 years: the amyloid hypothesis, which is the assumption that accumulation of the peptide amyloid-β is the main cause of the condition. Researchers proposed that when amyloid-β clumps together to form deposits in the brain, it triggers neurodegenerative processes that lead to the loss of memory and cognitive ability that is observed in Alzheimer’s disease. Amyloid-β is therefore an obvious therapeutic target — if you can deal with the peptide, then you can treat the condition. The amyloid hypothesis has never been universally accepted, and the failed drug trials have only emboldened its critics. “It’s led to a mixture of some careful thinking and recriminations about whether the right things have been done,” says John Hardy, a neurogeneticist at University College London, and a pioneer of the hypothesis. He and many other researchers remain undeterred, however. “We’re all disappointed, but there are concrete reasons why each failure occurred,” says Dennis Selkoe, a neurologist at Harvard Medical School in Boston, Massachusetts. These might be as simple as the drugs being administered too late in the disease progression to reverse the damage in trial participants. As Selkoe hints, the field could just be experiencing the frustrating journey of discovery that so often precedes the development of effective treatments. But if the idea on which this work is based is wrong, researchers could instead be nearing the end of a blind alley. Much hope is being pinned on ongoing trials in people who are deemed at risk of Alzheimer’s disease but who have yet to experience symptoms, including those with an inherited form of the condition. Yet amyloid-β is not the only potential cause, and some researchers think that it is time to explore alternative avenues. The brains of people with Alzheimer’s disease bear two cellular hallmarks: clumps of amyloid-β, known as plaques, that form outside cells, and strings of a protein called tau, known as neurofibrillary tangles, that form inside cells. Both deposits were first described more than a century ago, but it wasn’t until 1984 that George Glenner, a pathologist at the University of California, San Diego, isolated amyloid-β. Together with his colleague Caine Wong, Glenner showed that it is derived from a larger protein called amyloid precursor protein (APP), which sits in and crosses the cell membrane. 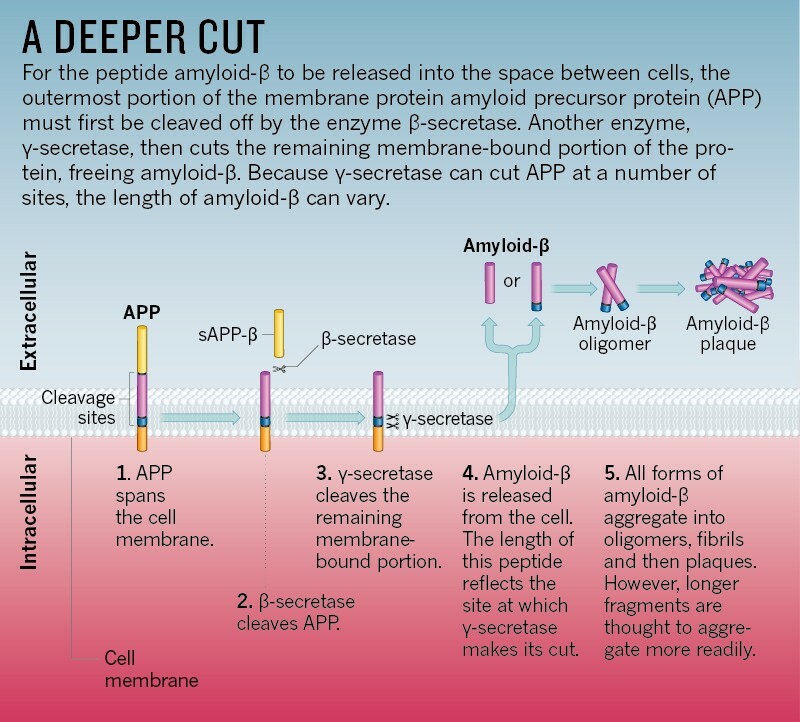 Subsequent research revealed the process that produces amyloid-β: the enzymes β-secretase and γ-secretase cut APP in two places, creating a peptide fragment (see ‘A deeper cut’). Glenner thought that amyloid-β might be the cause of Alzheimer’s disease, but the amyloid hypothesis did not take off until the discovery of the dominantly inherited mutations that are responsible for the familial forms of the condition. A team led by Hardy uncovered the first mutation1, in the gene APP, in 1991. Two more2 were identified in 1996, in the genes that encode the γ-secretase proteins presenilin 1 (PSEN1) and presenilin 2 (PSEN2), which affect the location at which γ-secretase cuts APP. The mutations favour the production of longer variants of amyloid-β that clump together more readily. This seeds the accumulation of amyloid-β into larger structures called oligomers. Further accumulation produces insoluble fibrils, which then aggregate into the plaques characteristic of Alzheimer’s disease. These plaques are often surrounded by a halo of soluble oligomers. The fact that such plaques consist of amyloid-β, combined with the discovery of mutations that increase amyloid-β aggregation, strongly implicates amyloid-β as the culprit in familial Alzheimer’s disease. “Those two things together are a powerful argument,” says Michel Goedert, a neuroscientist at the University of Cambridge, UK. The aggregation of amyloid-β is thought to trigger a cascade of disease-causing processes such as inflammation, tau-tangle formation, synapse dysfunction and cell death, which ultimately leads to dementia. The familial form of Alzheimer’s disease is almost indistinguishable from the sporadic form of the condition, except that it is rarer and arises earlier in life, so the idea that amyloid-β is the first step in the chain of disease progression was applied to all forms of Alzheimer’s disease. A common counter-argument to the amyloid hypothesis is that plaques are found in the brains of many elderly people with normal cognition. Proponents of the idea have a plausible explanation, however: seemingly healthy people who have such plaques might be in a pre-symptomatic stage of Alzheimer’s disease. They also say that not all plaques are equal. Numerous studies have suggested that soluble oligomers are more toxic than deposited plaques3, especially in terms of impairing synapses in regions of the brain that underlie memory. A 2013 study found that the oligomer concentration of the ‘haloes’ that surround plaques could be used to distinguish the brains of people with dementia from those without who had a similar plaque burden4. Given that they can sequester oligomers, which are more biologically active, plaques might, at least initially, have a protective role in Alzheimer’s disease. The weak degree to which plaque burden correlates with disease severity has also been used to criticise the amyloid hypothesis. Cognitive symptoms are linked more closely to the number and location of tau tangles than they are to the same characteristics of amyloid-β plaques. Furthermore, evidence from post-mortem examinations indicates that such tangles often occur in the absence of plaques. These observations have fuelled debate on the relationship between these two types of deposit, with some researchers suggesting that they arise independently in cases of sporadic Alzheimer’s disease. Experiments in mice and human cell lines show that human tau is required for some of the neuronal damage associated with the disease to occur. However, whereas mutations that lead to amyloid-β aggregation have been shown to exacerbate tangle formation, the inverse is not true — mutations that affect tau do not bring about the aggregation of amyloid-β. Some researchers therefore propose that amyloid-β is the driving force behind Alzheimer’s disease, and that the extent of tau tracks the condition’s symptoms more closely only because such tangles appear later in the chain of disease progression, when most cell damage is occurring. “That’s basically the amyloid hypothesis,” says Goedert. 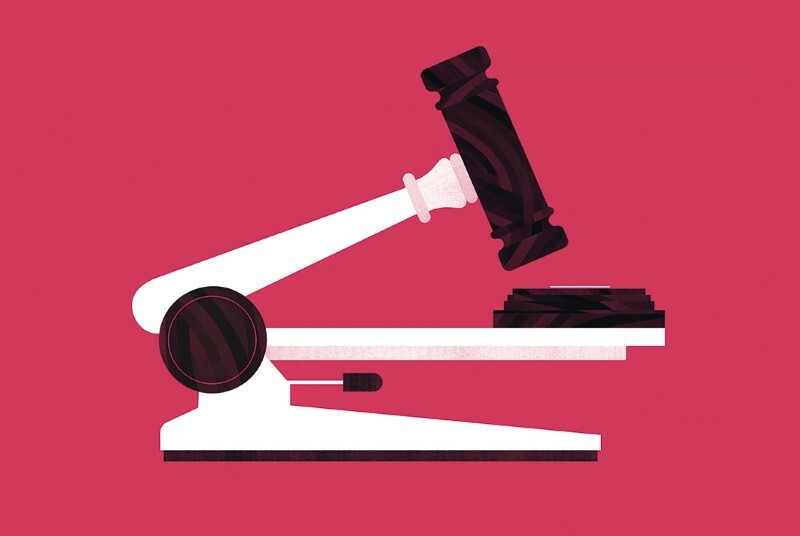 The greatest stimulus of objections to the hypothesis, however, is the disappointing track record in clinical trials of drugs that target amyloid-β. Various therapeutic approaches have been explored, including immunotherapy and the inhibition of either β-secretase or γ-secretase. The first trial of an immunotherapy that was designed to provoke an active immune response, in this case using a synthetic molecule of amyloid-β, was stopped in 2002 when 6% of participants developed inflammation of the brain and meninges. Semagacestat, the only γ-secretase inhibitor to reach a phase III trial so far, fared even worse. Testing was halted in 2011 owing to an increased incidence of skin cancer among recipients, but the drug also seemed to worsen participants’ cognition. People who received solanezumab, a passive immunotherapy that uses an engineered antibody to target amyloid-β, showed no significant slowing of cognitive decline in a phase III trial, despite hints at the drug’s efficacy in earlier clinical trials. A recent phase III trial of the β-secretase inhibitor verubecestat also failed. In some cases, the drugs were simply flawed. Semagacestat probably worsened the condition of its recipients because, in addition to APP, γ-secretase cuts numerous other proteins, some of which have crucial biological functions. Inhibiting the enzyme’s function is no longer thought to be a good idea; instead, researchers are working to shift the location on APP at which γ-secretase makes its cut, resulting in the production of shorter peptides while retaining functions that would be lost by blocking the enzyme. There is also optimism surrounding aducanumab, an antibody currently in phase III trials. Rather than helping to mop up soluble amyloid-β or blocking its production, aducanumab works to clear plaques. Initial trials in 2016 suggested that it could significantly slow cognitive decline in people in the early stages of Alzheimer’s disease. “The benefits were dose-dependent, which is what every scientist wants to see,” says Selkoe. Results from a phase III trial are expected by 2020; if it succeeds, it will be the first treatment targeted at amyloid-β to pass this hurdle. The most-cited explanation for the failure of such trials, however, is that the drugs are being given at the wrong point in the progression of Alzheimer’s disease. Positron emission tomography scans of the brain reveal that plaques can begin to form decades before cognitive symptoms appear, and that amyloid-β levels might have plateaued by the time that patients enter trials. “The general view is these are the right drugs, but they’re too late,” says Hardy. “It’s like taking statins when you’re having a heart attack.” If amyloid-β triggers processes that continue even after it is removed, “we probably already have a drug that could treat Alzheimer’s disease, if we gave it to people in their 50s”, says Michael Murphy, a neuroscientist at the University of Kentucky in Lexington. Several initiatives are under way to test drugs targeted at amyloid-β in people who are at risk of Alzheimer’s disease, before they develop symptoms. The Dominantly Inherited Alzheimer Network, based at Washington University School of Medicine in St Louis, Missouri, is running trials in individuals with mutations in APP, PSEN1 or PSEN2 to determine the safety and efficacy of interventions at this early stage of the condition. Initial participants will be treated with antibodies such as solanezumab for four years, but the researchers are also planning to test other drugs. Solanezumab is also being investigated by the A4 study, which is coordinated by the University of Southern California in Los Angeles. The drug will be tested over three years in people aged between 65 and 85 who are deemed to be at risk of dementia owing to the high levels of amyloid-β in their brains, as revealed by positron emission tomography scans. The future of the amyloid hypothesis could rest on the outcome of such trials. When drugs that have been shown to reduce amyloid-β are given to people who are expected to develop Alzheimer’s disease and they still don’t work, says Murphy, “that would absolutely convince me we’ve been misled and it has to be wrong”. Amyloid-β has dominated research on Alzheimer’s disease for decades — perhaps at the expense of other valuable ideas. Even the staunchest supporters of the amyloid hypothesis think that amyloid-β is not the only target worthy of intervention, especially if the downstream consequences of amyloid-β accumulation continue after the peptide is removed. But the development of drugs for alternative targets is lagging behind. Inflammation is also seen as an important target. In the later stages of Alzheimer’s disease, the immune cells of the brain, known as microglia, go into overdrive, killing neurons. Some researchers think that this is responsible for most symptoms of dementia, which means that inflammation could be a valuable target, even in people who are already experiencing symptoms. “The way to think about it is: which pathology to address at which stage of the disease?” says Rudy Tanzi, a neuroscientist at Harvard Medical School. He likens amyloid-β to a match that starts ‘bush fires’ of tau tangles, which lead to a ‘forest fire’ of inflammation in the brain. “If you treat a patient with full-blown dementia for amyloid-β, you’re trying to put out the forest fire by blowing out the match,” he says. Microglia exist in several states. In one such state, they release inflammation-promoting proteins called cytokines, as well as unstable molecules known as free radicals that can injure cells through oxidative stress. But in another, they clear away debris such as amyloid-β through a process called phagocytosis. Expression of the gene CD33 switches on the pro-inflammatory state, whereas TREM2 switches it off. Drugs that target these genes could therefore spare neurons by reducing inflammation while reducing tangle formation and stimulating the removal of amyloid-β. “If you can convert microglia from the pro-inflammatory state to the phagocytic house-keeping state, you hit all three pathologies,” says Tanzi. “That’s a magic bullet.” He has shown that cromolyn sodium, a treatment for asthma, triggers this conversion in mice. The drug is now in phase III trials for Alzheimer’s disease, and other groups are pursuing a similar approach. “Just about every pharma company still doing Alzheimer’s has started a CD33 programme,” says Tanzi. As well as therapeutic targets that fall well within the bounds of the amyloid hypothesis, some researchers are calling for an exploration of ideas that are beyond the mainstream. “Are we are going to tie up the whole field for another 15 to 20 years?” asks George Perry, a neurobiologist at the University of Texas at San Antonio. A normal function for amyloid-β has yet to be agreed on the field and, in general, it is considered to have a purely disease-causing role. But some think that is a mistake. “The current approach is based on the idea that amyloid-β is bad,” says Perry. “My idea is the opposite.” He suggests that amyloid-β and tau accumulation is actually a protective response to age-related metabolic pressures in the cell. For instance, oxidative stress increases with age, which damages mitochondria, the cell’s energy-producing organelles. Perry thinks that this promotes amyloid-β deposition, because energy shortages have been shown both to increase the expression of APP and to alter APP processing to favour the production of forms of amyloid-β that are more prone to aggregation. He points to studies5 that suggest amyloid-β can reduce oxidative stress in the brain when enough of the peptide has accumulated. By that point, however, the quantity of the peptide causes other problems. He has also found that amyloid-β binds tightly to copper, blocking its ability to catalyse the production of free radicals that can cause oxidative damage. This suggests that agents that bind copper, and so reduce oxidative stress as well as regulate levels of amyloid-β, might be useful, Perry says. Some researchers think that certain infections can cause Alzheimer’s disease, which suggests that antimicrobial or antiviral drugs might have therapeutic value. They cite evidence showing that infection with herpes simplex virus (HSV), part of the human herpesvirus (HHV) family, influences a person’s risk of Alzheimer’s disease6, and that variants of genes linked to sporadic Alzheimer’s disease, such as APOE, regulate immune function7. Although HSV has been found in the brains of people with and without Alzheimer’s disease, a study published in 1997 by Ruth Itzhaki, a neuroscientist at the University of Manchester, UK, suggests that the combination of HSV infection and the APOE ε4 gene variant confers a strong risk of developing the condition8. This implies that APOE could affect a person’s risk of Alzheimer’s disease by influencing their vulnerability to microorganisms, Itzhaki says. A decade later, having struggled to obtain funding to study this further, Itzhaki showed that infecting human cells or mice with HSV increased the level of amyloid-β9. “We had awful problems getting that published,” she says. “It’s been a series of battles.” In 2016, she and several colleagues published an editorial7 in the Journal of Alzheimer’s Disease, asserting that the role of microorganisms in Alzheimer’s disease had been neglected and calling for more research, including trials of antimicrobial agents. The article posited that certain microorganisms, when allowed to reside in the brain by an aged immune system, damage the organ both directly and indirectly through processes involving amyloid-β. Earlier this month, researchers led by Joel Dudley, a geneticist at Icahn School of Medicine at Mount Sinai in New York City, published work in the journal Neuron that revealed two strains of HHV (HHV-6A and HHV-7) are more abundant in the brains of people with Alzheimer’s disease12. They also found links between these viruses and networks of genes and proteins that are related to APP processing. In the same issue of Neuron, Tanzi and his colleagues showed that HHV-6 and HSV-1 can seed amyloid-β plaques in mice and 3D cultures of human neurons, and also that amyloid-β deposits in the brain protect mice against infection with HSV-113. Although neither study shows definitely that these viruses cause Alzheimer’s disease, data from a population-wide health database in Taiwan have been used to suggest not only that HSV infection increases the risk of developing the condition, but also that people treated with antiviral drugs are ten times less likely to develop Alzheimer’s disease14. Tanzi is careful to distinguish his proposal from those that suggest microorganisms are directly responsible for the damage observed in Alzheimer’s disease. 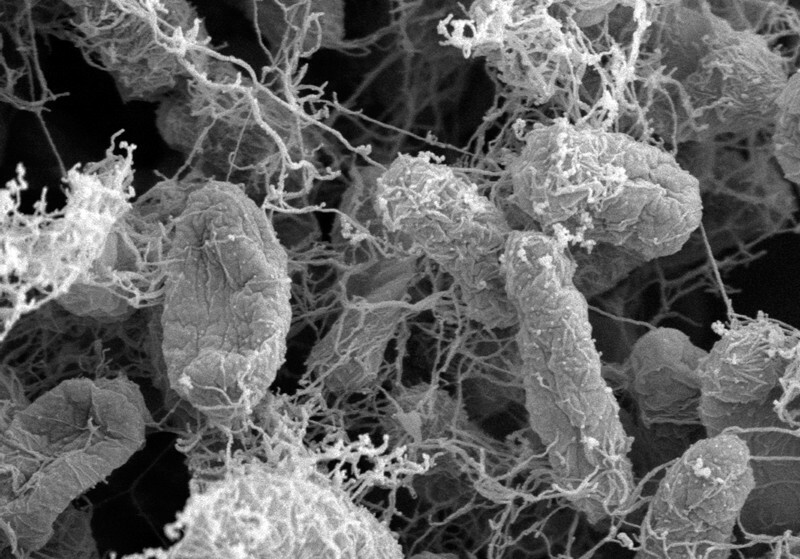 “We’re not saying that; we’re saying microbes are the prequel to the amyloid hypothesis,” he says. “This is one way to light the match.” Inherited forms of Alzheimer’s disease represent another way, as could nanoparticles from the environment, he adds. If the idea holds up, Tanzi can foresee preventative action being taken against agents that seed amyloid-β plaques. The amyloid hypothesis is approaching a crucial juncture: with several trials under way in people who are yet to experience symptoms, either it will be confirmed beyond reasonable doubt or its critics will be validated. Many supporters of the amyloid hypothesis are convinced that they are on the right track. “We understand a lot,” says Goedert. That knowledge has yet to deliver clinical benefits, he admits, but he is confident that treatments founded on this understanding will emerge eventually. “If the aducanumab trial has a positive result, we could be awfully close,” says Murphy. But if it fails, much will depend on the trials aimed at preventing Alzheimer’s disease. Any success would be of great interest to both patients and researchers; even just a proof of principle “would be psychologically important”, says Goedert. 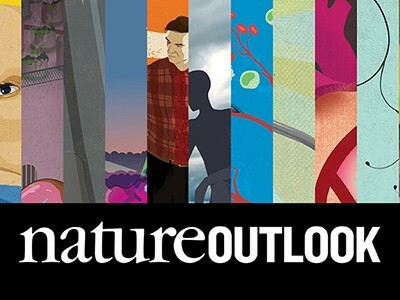 This article is part of Nature Outlook: Alzheimer’s disease, an editorially independent supplement produced with the financial support of third parties. About this content. Goate, A. et al. Nature 349, 704–706 (1991). Scheuner, D. et al. Nature Med. 2, 864–870 (1996). Haass, C. & Selkoe, D. Nature Rev. Mol. Cell Biol. 8, 101–112 (2007). Esparza, T. J. et al. Ann. Neurol. 73, 104–119 (2013). Nunomura, A. J. et al. Neuropathol. Exp. Neurol. 60, 759–767 (2001). Lövheim, H. et al. 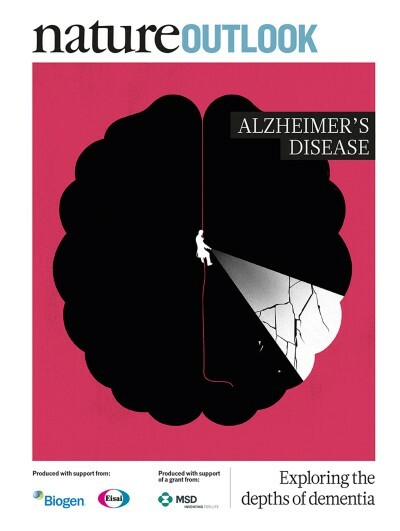 Alzheimers Dement. 11, 587–592 (2015). Itzhaki, R. F. et al. J. Alzheimers Dis. 51, 979–984 (2016). Itzhaki, R. F. et al. Lancet 349, 241–244 (1997). Wozniak, M. A., Itzhaki, R. F., Shipley, S. J. & Dobson, C. B. Neurosci. Lett. 429, 95–100 (2007). Kumar, D. K. et al. Sci. Transl. Med. 8, 340ra72 (2016). Wozniak, M. A., Mee, A. P. & Itzhaki, R. F. J. Pathol. 217, 131–138 (2009). Readhead, B. et al. Neuron 99, 64–82 (2018). Eimer, W. A. et al. Neuron 99, 56–63 (2018). Tzeng, N. S. et al. Neurotherapeutics 15, 417–429 (2018).